Their work has been carried out on mice, but it suggests mobiles might protect against Alzheimer's. Florida scientists found that phone radiation actually protected the memories of mice programmed to get Alzheimer's disease. They are now testing more frequencies to see if they can get better results. The study by the Florida Alzheimer's Disease Research Centre is published in the Journal of Alzheimer's Disease. It involved 96 mice, most of which had been genetically altered to develop beta-amyloid plaques in their brains, which are a marker of Alzheimer's disease, as they aged. The rest of the mice were non-demented. 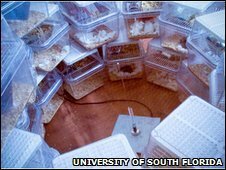 All the mice were exposed to the electro-magnetic field generated by a standard phone for two one-hour periods each day for seven to nine months. Their cages were arranged at the same distance around a centrally located antenna generating the phone signal. The researchers, led by Professor Gary Arendash, said that if the phone exposure was started when the Alzheimer's mice were young adults, before signs of memory impairment were apparent, their cognitive ability was protected. In fact, the Alzheimer's mice performed as well on tests measuring memory and thinking skills as aged mice without dementia. If older Alzheimer's mice already showing memory problems were exposed to the electro-magnetic waves, their memory impairment disappeared. Professor Arendash was the author of a previous study that said coffee could protect against Alzheimer's. He said: "It will take some time to determine the exact mechanisms involved in these beneficial memory effects. "One thing is clear, however - the cognitive benefits of long-term electro-magnetic exposure are real, because we saw them in both protection and treatment-based experiments involving Alzheimer's mice, as well as in normal mice." The memory benefits of phone exposure took months to show up, suggesting that a similar effect in humans would take years. The researchers conclude that electro-magnetic field exposure could be an effective, non-invasive and drug-free way to prevent and treat Alzheimer's disease in humans. They are currently testing whether different sets of frequencies and strengths might produce a more rapid and greater cognitive benefit. Chuanhai Cao, another author of the study, said: "Since production and aggregation of beta-amyloid occurs in traumatic brain injury, particularly in soldiers during war, the therapeutic impact of our findings may extend beyond Alzheimer's disease." The authors say previous studies have linked a possible increased risk of Alzheimer's with "low-frequency" electro-magnetic exposure like the energy waves generated by power and telephone lines. They say mobile phones emit "high frequency" electro-magnetic waves that are very different because they can have beneficial effects on brain function, such as increasing brain cell activity. They did carry out autopsies on the mice and found no evidence of abnormal growth in the brains of the Alzheimer's mice following months of exposure to the electro-magnetic waves. They also found all the major peripheral organs, such as the liver and lungs, were normal. Rebecca Wood, chief executive of the Alzheimer's Research Trust, said: "This research has been carried out in mice that mimic some of the symptoms of Alzheimer's in people, so we don't know if any similar effects will be seen in humans. "Although the researchers hope their findings will translate to people, much more research is needed to find out if there could be any beneficial effects of long-term exposure to electro-magnetism, and to guarantee its safety. "We don't recommend spending 24 hours a day on a mobile phone - we don't know the long-term effects, and bills could go through the roof." Dr Susanne Sorensen, head of research at the Alzheimer's Society, said the results were "exciting and quite convincing". "However, this research in mice is at an early stage and a lot more work is needed before we can say anything about the possible preventative or treatment effects of this type of radiation on people with Alzheimer's disease." A spokesman for Mast Sanity said other studies had shown adverse effects of mobile phone radiation on the brain. And the Institute of Engineering Technology (IET) cautioned: "All isolated reports of health effects associated with low-level exposure to electromagnetic fields, regardless of whether they are beneficial or detrimental, should be treated with some caution."